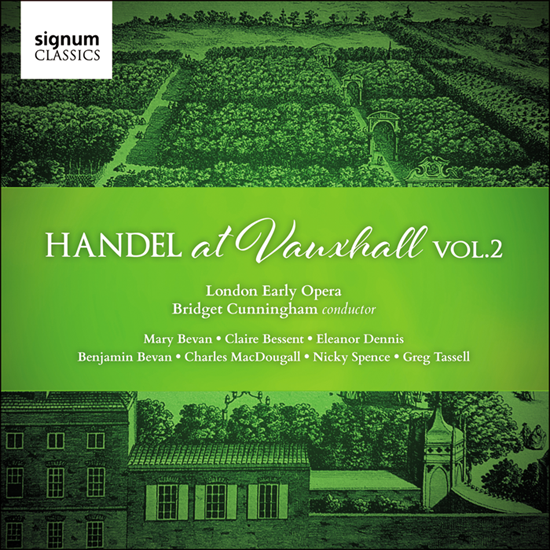 This recording is the second part London Early Opera’s exploration of the music of Handel as it might have been performed at the Vauxhall Pleasure Gardens in the 1740s. Their 2017 recording, Handel at Vauxhall: Vol 1 (reviewed here) presented the first half of a conjectural reconstruction of typical evening’s entertainment, and we now have the second half, continuing the fascinating mix of orchestral, organ and vocal music. Each half of these concerts usually had around eight pieces, usually including an organ concerto, other instrumental pieces, songs and dances, performed from the central bandstand. The opening song of the second half, Spring Gardens: Flora, goddess sweetly blooming sets the scene, noting that “Belles and beaux are all invited / To partake of varied sweets . . . as breaking notes descending / Break upon the list’ning ear”. In complete contrast, it is followed by the Concerto Grosso (Op 6/4), one of a set of twelve published in 1739/40 in homage to Corelli. Much of the music for the various London Pleasure Gardens was composed by well-known organists of City churches, who also played regularly at the very secular entertainments. On this recording, organist-composers such as William Boyce, John Stanley, Thomas Gladwin are represented. There are a number of unusual and little-known pieces, like Handel’s take on contemporary politics: “From scourging Rebellion, and baffling proud France – A song on the victory obtain’d over the rebels by His Royal Highness the Duke of Cumberland” (HWV228/9). A promotional ditty by Thomas Gladwin “Colin’s description of Vauxhall ‘Green-Wood Hall’ – O Mary, soft in Feature” includes the lines “I’ve been at dear Vauxhall / No Paradise is sweeter / Not that they Eden call”. It also includes a reference to the “man of stone”, the famous Roubiliac statue of Handel which stood in the gardens. There is no organ concerto on this recording, but a solo organ introduces Handel’s Hornpipe in D (HWV 356) which was specifically ‘Compos’d for the Concert at Vauxhall 1740’. The eight-piece second half finishes with a performance of Comus, Handel’s masque Comus or There in the Blissful Shades (HWV 44) composed as an epilogue to Thomas Arne’s Comus for an open-air performance at the Earl of Gainsborough’s estate in Rutland. Handel’s contribution includes three songs, each with a concluding chorus, the final one being Happy, happy, happy plains! Three bonus tracks are added to make up the (still relatively short) CD timing, concluding with an early version of the British national anthem, “God save great George ye king” dating from around 1745. The CD comes with very complete notes, in English only, including an essay on the Vauxhall Gardens by David E Coke (co-author of a book on the gardens) and a detailed description of the music by the founder and conductor of London Early Opera, Bridget Cunningham. The recording acoustic is very different from that experienced by the Vauxhall audience, the two large churches used giving a slightly boomy acoustic bloom to the music. The performances and performers (Mary Bevan, Claire Bessent, Eleanor Dennis, Benjamin Bevan, Charles MacDougall, Nicky Spence, Greg Tassell) are impressive, although some of the singers have rather too much vibrato for my tastes. I particularly like Greg Tassel’s singing on a number of tracks. Bridget Cunningham directs with a fine sense of 18th-century style, and provides very effective harpsichord support. More details about the recording, including click-throughs to the programme notes can be found here. London Early Opera are giving a concert on Wednesday, 4 April, at St George’s, Hanover Square, Handel’s own church, as part of the London Handel Festival, which includes music from both of these Vauxhall CDs. Details here.